Myth: “Sleep Tight, Don’t Let the Bedbugs Bite” found its origin in the early 1700s, and it is a reminder to tighten the ropes on the bed before sleeping. The “bedbug” is the bed wrench, so “don’t let the bedbugs bite” means to be careful and don’t pinch your fingers on the wrench. The phrase is a reminder to fasten your nightgown around you tightly, so the bedbugs will be unable to climb through them. Truth: This is a very common myth, but it is ultimately a myth, and it is one we are often asked about on our tour of the John Chad’s house. The two main faulty interpretations of this phrase are stated above. The idea is, in order to sleep well on a rope bed, the ropes must be tightened on a regular basis. If the ropes became too slack, the occupant would have a very uncomfortable night’s sleep. So one of the household chores, normally given to small children, was to use the bed wrench to tighten the ropes every day so they remained taut. Some even believe that a passive aggressive way to get rid of unwanted guests was to let the ropes sink lower and lower, until the bed became so uncomfortable that the guests would leave. But that is a myth for another day. Bed bugs were common, lived in mattresses, and would bite the bed’s occupant. So this myth does hold up to a certain extent, showing how beds needed to be regularly tightened and bugs were likely to bite you in your sleep. However, this phrase couldn’t plausibly refer to a tight rope bed, because the first known citation of “sleep tight” was in the late 19th century, long after rope beds were in common use. As to the need to keep your nightgown fastened tightly, the bedbugs would live in the mattress and would be undeterred by nightgowns, fastened tightly or not. The truth of the meaning behind “sleep tight” is that it is really more of a prayer than anything else. To sleep “tight” meant to sleep well or soundly, to sleep safely until morning, and has been listed in the dictionary as such. So when I wish you a good night, “sleep tight, and don’t let the bedbugs bite,” I am wishing you a good night’s sleep and I hope you remain safe till morning. And here’s hoping those bedbugs don’t bite you during your sound sleep. 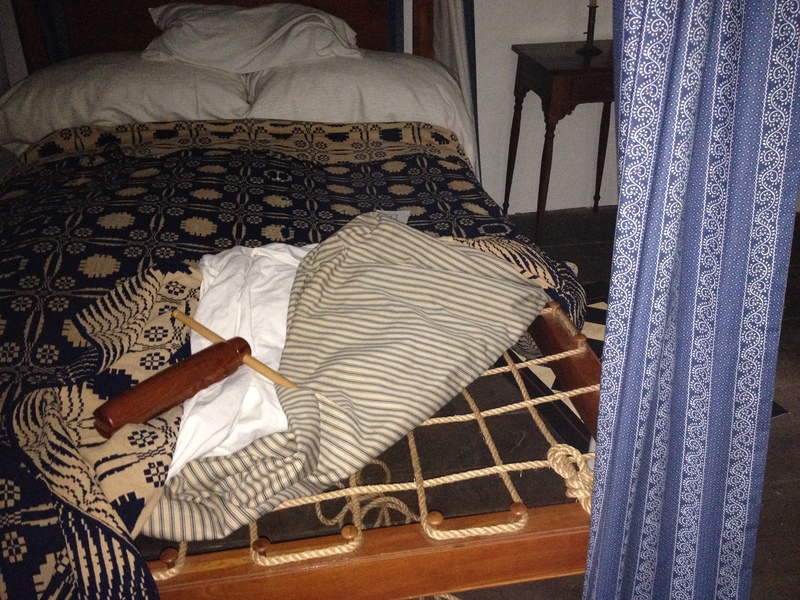 Come see our rope beds for yourself at the Chadds Ford Historical Society; we are open every Saturday for tours. Hope to see you there! Categories: Mythbuster Friday | Tags: colonial, culture, Mythbuster Friday | Permalink.